As we addressed in our introductory blog on Growth-Driven Design, the traditional process for designing a website is broken. Budget overruns and delayed launch dates created a demand for a better approach to website design. Growth-Driven Design, which uses real data from users to drive improvements to your site, is built around three core phases: Strategy, Launch Pad and Continuous Improvement. In this blog, we focus on strategy. Every successful website project begins with a well-defined strategy. Without a strategy, the success of a new site is mostly left up to guesswork and is unlikely to take the needs of the user into account. While the heavy lifting for your website (i.e. copy, design, coding, etc.) will be performed by the marketing team, the strategy phase of the project allows you to involve stakeholders throughout your organization who can provide valuable feedback and insights to help drive the success of your site. The first step to a thorough website strategy is to understand your site visitors. One of the best places to start is by defining your website target audiences and developing buyer personas for each audience. A buyer persona, which is based on market research and real data, is developed by examining customer demographics, behavior patterns, motivations and goals. These personas represent your ideal customers based on your market research. If you are unfamiliar with buyer personas, there are online tools available to help walk you through the process. HubSpot provides one such tool at https://www.hubspot.com/make-my-persona. Once you have developed your buyer personas, it is time to consider the journey that each of these personas travels when making a buying decision for your product or service. This is critical to having a customer-focused website. The main stages of the customer journey are awareness, consideration and decision. What are the visitor’s motivations? Channels: Where are the visitors coming from and how did they find your site? Touchpoints: Where are the key opportunities for interaction with these visitors? Emotional Response: What emotions are the visitors feeling at each stage of their journey? If you need additional assistance developing your customer journeys, you can view a more detailed walk-through of customer journey mapping at https://www.growthdrivendesign.com/how-it-works/journey-mapping. Now that the target audience has been identified and their journey further defined, user research helps us to learn more about how these groups of visitors use the website. You can use several tools to learn more about site visitors. Even currently underperforming websites can offer valuable insight into users’ experiences and expectations. Existing Analytics: If you don’t have a Google Analytics account on your current site, set one up today. Google Analytics can tell you which pages are (and aren’t) being visited on your current site and where visitors are spending the most time. It also has other valuable insights including the ability to identify pages where visitors frequently enter your site, such a popular blog post. Site Search: Do you have an existing site search tool on your website? If so, take a look at popular search terms. Are users searching your site for content that doesn’t currently exist? If so, creating that content may become a top priority for the new site. Heatmaps: You can use heatmapping tools such as HotJar or CrazyEgg to track users’ mouse movements on your site. These tools can help you visually identify navigational challenges that your visitors may be experiencing. Surveys: If you’re unsure of what your visitors are looking for on your new site, there’s an easy way to find out—just ask them! User surveys, whether distributed via email to your distribution list or implemented as pop-up forms throughout your current site, can provide valuable insights direct from your customers. Clear Objectives – Allows you to direct the website build to your desired results. Customer Focus – Utilize your customer research to shape your site with the end customer in mind. Functionality Wish List – In the next stage, you’ll begin to sort this by priority for biggest impact. Remaining ideas can be tested during the continuous improvement phase. Following this session, you should have the direction that you need to move on the Launch Pad phase of Growth-Driven Design. We’ll cover the Launch Pad process in our next blog on Growth-Driven Design. Watch for our upcoming e-book on Growth-Driven Design. Interested in learning more about the Growth-Driven Design process? 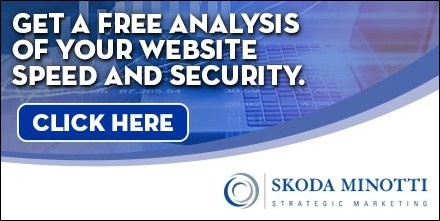 Skoda Minotti Strategic Marketing is Growth-Driven Design Agency Certified, and we can help you determine how this approach might improve your next website design project. To start the conversation, contact Bob Goricki at 440-449-6800 or fill out our contact form here. This entry was posted in Digital Marketing, Mailchimp RSS, Strategic Marketing and tagged buyer persona, customer journey, data, growth-driven design, online tools, strategic marketing, strategy, updates, user research, website. Bookmark the permalink. Follow any comments here with the RSS feed for this post. Comments are closed, but you can leave a trackback: Trackback URL.